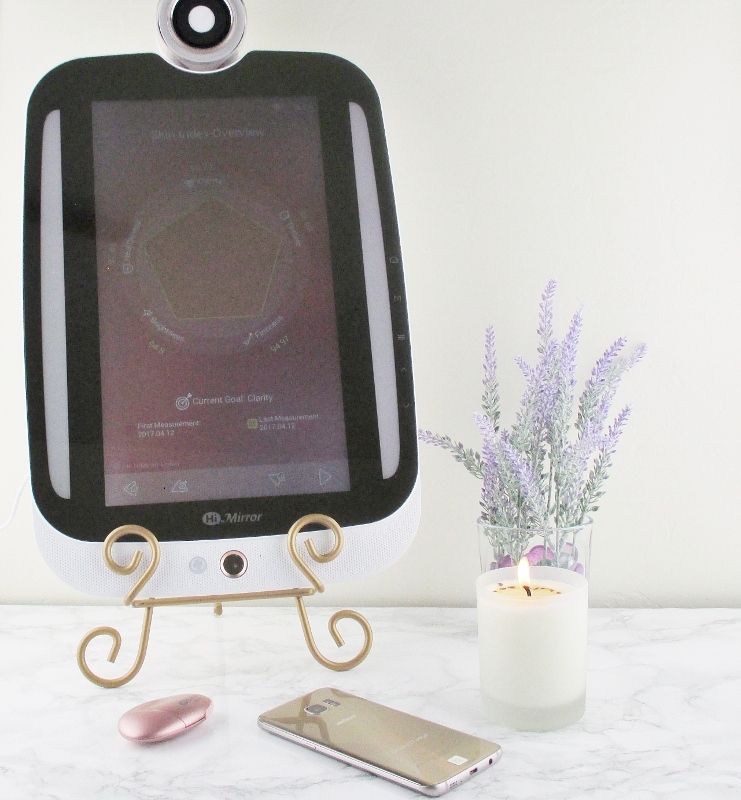 Say hello to Hi Mirror Plus, the next generation, souped up version of the acclaimed Hi Mirror, the advanced smart beauty mirror that is a tech and skin care fanatic's dream and my new beauty companion. Out of the box, Hi Mirror Plus is easy to mount on a mirror or wall or set up on a table top in a sturdy easel or plate rack, fire up and get going. I started by watching a quick video tutorial right on my mirror that would guide me through the easy and quick mounting process (had I not decided to use an easel). I was dismayed to see that the woman featured in the segment teaching how to mount this device to a mirror was replaced by a man when it came time to mount it to a wall. What? A girl can't use a power drill, hammer and drywall anchors? Huh. Then who mounted my shelves in my laundry room? I know... Let it go. Nope. I feel that the video is sexist and I'm going to ding it. After I uploaded the Hi Mirror and Hi Skin Apps to my smartphone from Google Play (or The App Store for IOS), getting my mirror in action and my first skin analysis took only minutes. Everything is laid out, step by step. Follow the yellow brick road, it's easy-peasy. When I first turned my mirror on, I opened the camera and let the mirror take a picture. Then, I was asked to speak a phrase to it to teach it my voice. 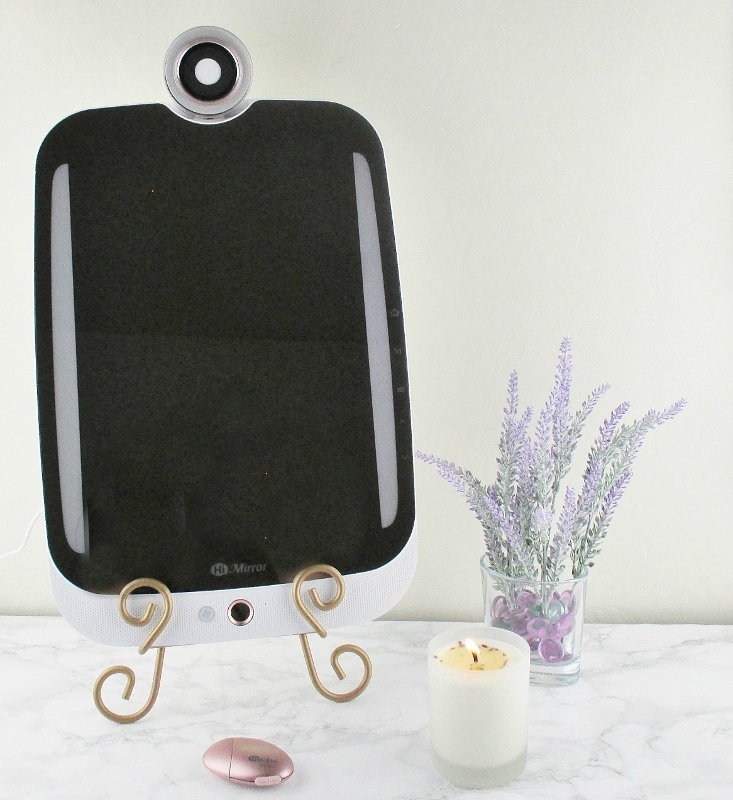 The beauty of this mirror's software is that the advanced face recognition and voice recognition make it possible for up to six people to use the mirror, each with their own personalized settings. The main way to navigate through the menu and various other features is with a hand gesture. I learned, after much trial and error that holding my hand with my fingers in tight, my hand fully upright and canted at a slight angle (as if I'm going to snap off a salute) works best. The mirror taught me the correct distance from the surface and the speed at which to move my hand. The gesture recognition is not perfect, I often have to repeat and can, at times get a little frustrated and I find myself wishing that the mirror understood and responded to more voice commands. It's easier, for me to say, "Hi Mirror. Listen." and give it the command. But so far, it only seems to let me in and to take me to my Home screen by voice. I wanted to get a picture of my skin analysis on my mirror, but my camera and lighting could only do so much and I'm not a crack shot with Photoshop. I hope that it gives you an idea, tho. 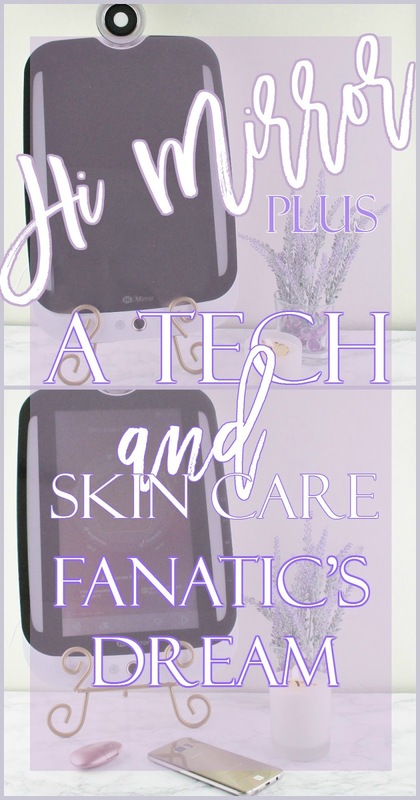 In addition to my Hi Mirror Plus, I received the Hi Skin attachment, a little skin analysis tool that gives an even more in depth picture of the skin's condition, both in individual areas and overall. I've not played with it, all that much because honestly, I'm just enjoying and getting good feedback from the in mirror photo feature. Getting a skin analysis couldn't be easier! Turn on the mirror, sign in by camera or voice and the mirror will scroll through local weather and a headline or two then offer to take a pic and check my skin's condition. The mirror guides positioning, so that I'm at the right distance and angle, then it snaps the shot, analyzes my skin, according to what it sees then it pops my results. Quick and painless. Now, skin care is important to me and I spend a lot of time and money taking care of my skin and I was happy to see, according to Hi Mirror Plus I am doing a good job! Texture, wrinkles, pores, tone, brightness all in the upper 90%. Brightness is a little lower, due to my monstrous dark circles. Since they are hereditary and exacerbated by allergies, those babies aren't going anywhere. While I definitely have some room for improvement, I was really happy to see that overall, my skin is good. I was curious about how this mirror would judge my skin, as a 52 year old woman, as opposed to how it would judge the skin of a 25 year old. The mirror, upon setup asks for age and date of birth so my skin is analyzed on my own level, not against parameters set up for someone half my age. Well done! Hi Mirror Plus can store my favorite skin care products and give me recommendations on new or different ones to try to further improve and maintain my complexion. Hi Mirror is a full service Personal Beauty System, not only does it analyze my skin, it can, with an attachment help to track weight, as well. I am still enjoying getting to know all of the features and nuances of my Hi Mirror Plus. I am looking forward to the day it will synch with my Pandora account because, Mama likes her music when she's getting ready. Is Hi Mirror Plus something that you'd like to pick up for yourself or someone special? Imagine the look on your mom's face, when she opens this bad boy on Mother's Day! 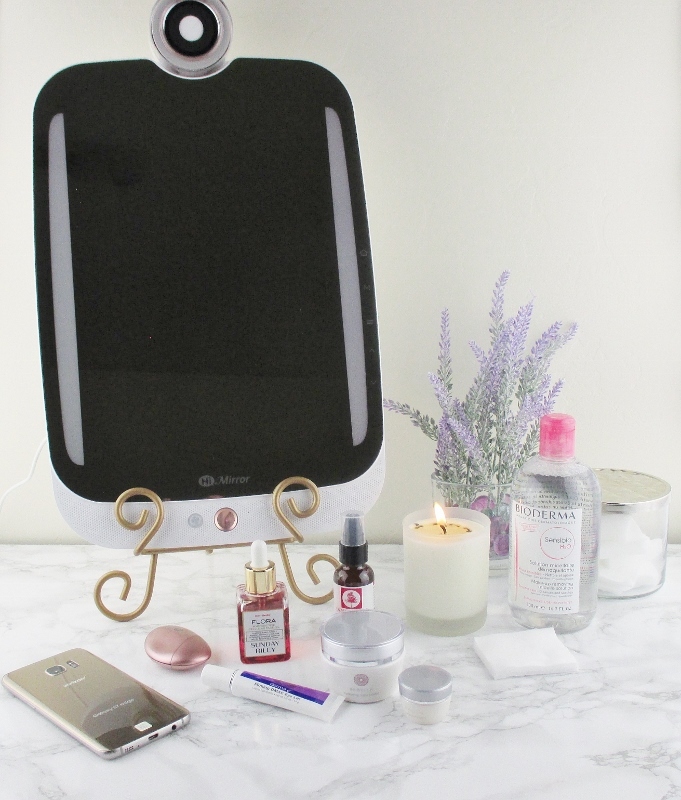 If you are ready to invest in a smart beauty mirror that can help guide you to the best skin of your life, use code 139XO to receive a 5% discount. This is not an affiliate code, it is a special discount, just for you. 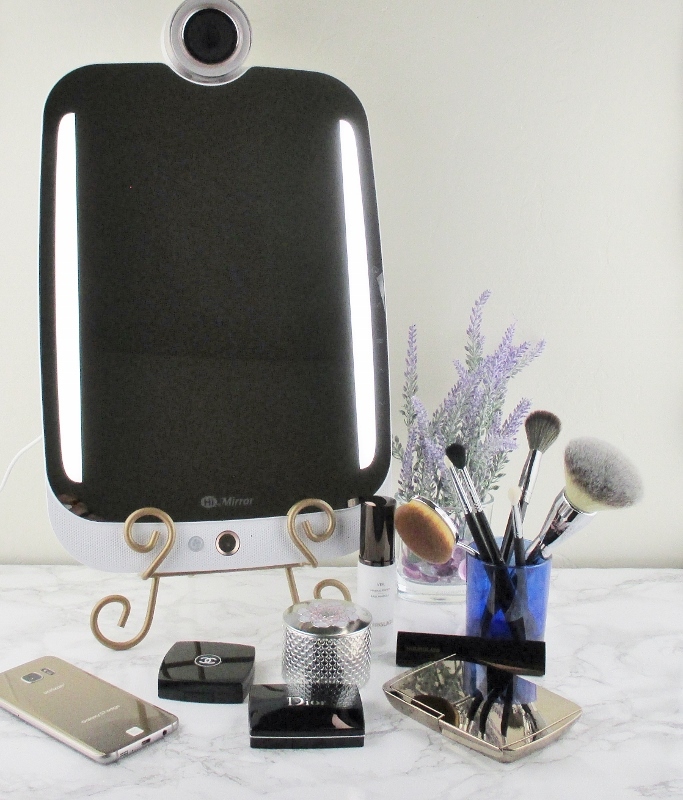 Please check out Brooke's and Sheila's posts for their take on the Hi Mirror Plus. This sounds like such a cool mirror, and I love the fact that it's attractive, the kind of mirror that I'd want to display! I am so happy with how pretty it is! It looks great on my dressing table. The more I read about this mirror the more interested I am in it. I tried a different "intelligent" mirror which was nice but this seems even better. I think this is a great product, just wish it wasn't so expensive. This is neat. I'm not very interested in it, but I think it's amazing that they have released something with this kind of technology. That's very cool! This thing is so fun and I love it better now with the lights!! I think that you'd love it. It's fun to use and the skin analysis features are so useful to anyone interested in improving their complexion. I've heard so many great things about this mirror and I want to try, too bad it's not available here where I live. That really blows. I hope that it becomes available in your area. I think it looks cool but I don't know if it would be able to work with my rosacea. That's a real concern. I know that I get a hard ding on the brightness category because of my dark circles. Those babies aren't going anywhere and the mirror sees them as flaws, not a chronic condition. OH WOW!!!! This sounds fantastic!!! and indeed, a smart mirror. Can you teach it to respond to "mirror, mirror, on the wall..."? totally serious question. I wish! lolol It does respond to Hi Mirror. Listen. So far, tho I'm extremely limited in the voice commands to which it reliably responds, tho. I would really love to try this mirror!! You would have so much fun with it! Girl! It is! You'd love it. I think that the mirror is pretty awesome and I think with a few updates and such, it would be incredible and something I'd see myself using daily. I struggled hard with the hand gestures, but over time I got the hang of the for the most part. It's very interesting to see your results daily for sure! The hand gestures are the clunkiest part of it for me, too. Having it sitting on my dressing table, rather than hanging I think hampers that a bit I'm getting better at it, tho so that's good. :D I would love a magnification upgrade and for the lights to work without having to turn on and boot up the whole system.